I almost left this out of the collection since it was so embarrassingly flattering at a time when I felt anything but confident. But it helps tell the story of that difficult beginning, so in the interest of completeness, I let it stand. It’s not that it’s negative or anything… far from it. But imagine this: I return from the 762-mile shakedown trip through Ohio, Indiana, and Kentucky with a bulging to-do list and knee inflammation. It’s raining, my girlfriend is disgusted with me, I’m deep in debt, and I’ve just spent a day visiting my ex-wife and 3-year-old daughter who gazed up at me and plaintively asked “why?” when I tried to explain the lure of the road. I fight rush-hour traffic to my old address northwest of Columbus with the whole “Computing Across America” idea feeling absurd and irresponsible. There’s the old place where I was stuck, paying a mortgage for four years. I turn into my driveway, the FOR SALE sign hidden in tall grass, park the bike, hobble to the front porch, and pick up the soggy small-town newspaper to find this effusive article… making me out to be some kind of hero! Had he called me a loony, it would not have been more painful. Putting me on a pedestal when I felt little but uncertainty was excruciating. This describes the adventure upon which Steve Roberts of Dublin has embarked. 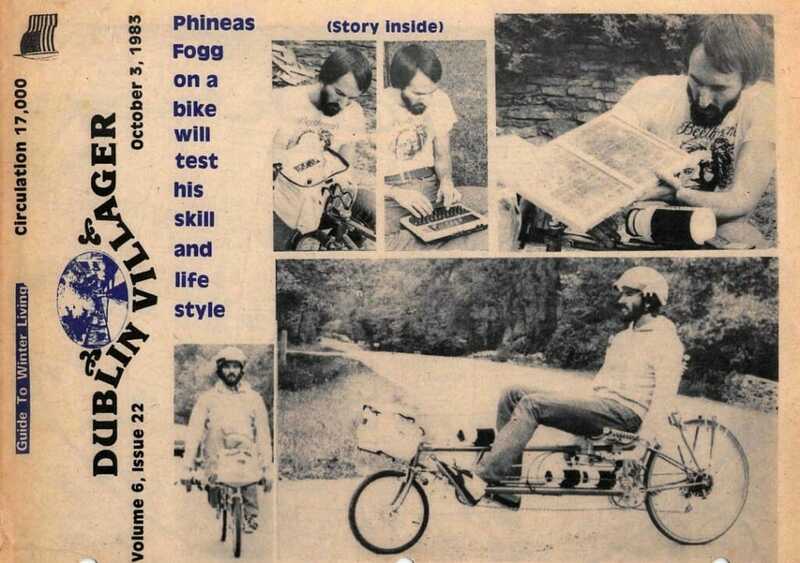 He is a young man of vision… a young man who is playing the notes of the “Song of the Open Road” on a computer and 18-speed hand-crafted bicycle while pursuing, in vagabond style with class, his quest for his own impossible dream. Like the Phineas Fogg of Around The World in 80 Days fame Roberts will traverse the United States of America for about a year or more (no set time has been calendared) while his odometer registers in the 15,000 mile range. Roberts is a computer whiz if there ever was one. Roberts will do much more than spin his wheels. His journey will be much in the tradition of “On The Road” with Charles Kuralt as he stops as the spirit moves him at many homes and offices of CompuServe subscribers. Steve Roberts is a genius and, like most geniuses, cannot let time nor failure impede him from his goals. Trial and error will still be there as he bikes along the byways from coast to coast and border to border. Steve will use the CompuServe network for his communication needs. His bicycle is something that only the developers of “Mission Impossible” could have dreamed up as it is loaded with a computer, communications system (including tapes), CB radio, solar converter by Solarex with which to keep the batteries charged, a security system that rivals anything on the market (touch the bike or anything on it and you’ll be sorry if you haven’t asked permission) and some supplies such as water and dried food to gulp and munch along the way. Steve Roberts is no newcomer to the world of computers. He started to turn his dream into reality at the age of 16 when he graduated from high school. After pursuing a vagabond lust for the open road for several years his attention turned to the field of engineering. Like the famous George Page, Jr., (who designed the C-46 airplane that flew the hump (Himalayas Mountains) during World War II) Steve didn’t let the lack of a college education deter him from reaching his goals. After creating a master mind he called BEHEMOTH (Badly Engineered Heap of Electrical, Mechanical, Optical and Thermal Hardware) he suddenly had fame at his fingertips. Those who had shunned him as an employee because of the lack of a college degree, were now at his doorstep bidding for his services. His list of credits with nationally known firms and books he has written on the subject of “Computers” would fill a book in itself without any facts or figures in a story form. Roberts tired of the “Madison Avenue Man in the Grey Flannel Suit” approach appeal and started to use his talents for writing only. He lists himself as a technical writer whose income depends on his need for money. Not one to be tied down to life’s pushbutton existence in the world of computers Roberts searched for the combination of freedom and security that would give him the opportunity to see himself as others see him… a man looking for a niche in life that fits his style and beliefs like a glove. His freedom of life will come first on his trip. He will travel with sophisticated computer equipment including two computers: one that will keep controls on his physical unmotorized trip such as his speed, miles traveled, etc. and a word processor. His smell of the open road might find him lolling comfortably under a tree in some farmyard or in a high-roller office of a major firm. Not being knowledgeable of the computer field except the video display terminal upon which this copy will be typeset…we cannot analyze with any degree of layman’s language the intricate world in which he will be traveling. Steve Roberts is “The Man of La Mancha” with a quest: not to rid the world of its evil potions and foes… but to increase the knowledge that man has available to fill the many dull voids that life with its intangibles and tangibles has to offer. It is an adventure that has no dated time frame. The time warps could compare him with Christopher Columbus, Marco Polo, Leonardo DiVinci, Thomas Edison, Albert Einstein and others who dared to intrude into a world that manv said would be better left alone. Only the sands of time record Steve Roberts’ journey and whether it was a success or failure. One thing that Steve Roberts has going for him is his determination that only through failure do you have the courage to still reach for success and the stars. [From “Courage ” by Amelia Earhart Putnam. 1897-1937].